Click on the link below to find The Vineyard Church’s Online Giving page. On this page click on the drop down for “Choose Campus” – select any from the drop down. Then the tab for “Choose Designation” will be available, click and from the drop down select “Price, Stephen & Anna.” or “Stephen & Anna Price.” Fill out the form with your amount and payment method. Hey! It wasn’t too hard to line up our monthly giving. So glad we can be helping partner with what God’s doing in Central Mexico!! Great to hear!! Thanks so much for supporting and encouraging us. Blessings! Hey! 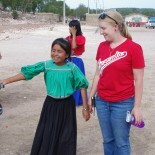 Just read your story on the first trip to the Huichol village. I’m sending money through Urbana Vineyard to help get those radios for the Huichol! Felt strongly that the Lord wanted the people to hear the Word of God. You guys rock! Thanks Kristen! Your gift went through 🙂 We will post an update about the radios, the other missionaries that work with the Huichol and started this ministry are getting the first round of radios and then we will look at ordering the next shipment. We will definitely blog and make sure you receive the info from the response of the huichol to the radios.